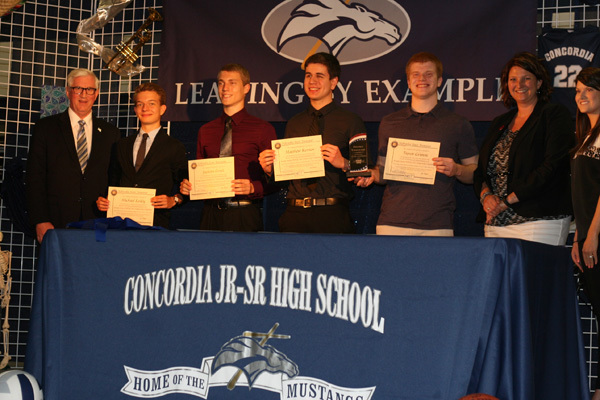 Members of the first-place Personal Finance Challenge team with their certificates presented by Treasurer Stenberg at the Concordia High School’s Leadership Banquet on May 6. From left, Treasurer Stenberg, Michael Eesley, Jackson Grasz, Matthew Kernen, Trevor Grimm, Jennifer Davidson of the Nebraska Council on Economic Education, and teacher Rebecca Schaaf. Students from Concordia High School in Omaha, Johnson-Brock High School, and Alliance High School took first, second, and third places respectively at the Personal Finance Challenge competition, sponsored by the Nebraska Council on Economic Education, State Treasurer Don Stenberg announced today. Stenberg said each member of the three winning teams will receive a college savings account scholarship through the Nebraska Educational Savings Trust (NEST). Stenberg is Trustee of NEST, Nebraska’s state-sponsored 529 college savings program. The four members of the first-place Concordia team, who each will receive a $2,000 NEST scholarship savings account, are Trevor Grimm, Matthew Kernen, Jackson Grasz, and Michael Eesley. Members of the Johnson-Brock team, who each will receive a $1,000 NEST account, are Scott Riley, Brooklyn Westenburg, Kendra Alberts, and Samantha Teten. Members of the third-place Alliance team, who each will receive a $500 NEST account, are Rhegan Fritzier, Bailey O’Conner, and Anthony Hare. The Concordia High School team will represent Nebraska at the National Finance Challenge competition May 22 in Kansas City, Mo. “Congratulations to all the students who participated in this valuable learning experience, both those who participated in the preliminary online testing and those who took part in the face-to-face competition. I was impressed with the students’ presentation skills and their understanding of financial issues facing families. The students I met were confident, articulate, and knowledgeable, all qualities that will serve them well as they continue their education and prepare for careers and community service,” said Stenberg, who was a judge at the Lincoln competition. “As the chief financial officer of the state, I am committed to helping young people attain a greater understanding of personal finance to help them become smart consumers and investors who will be able to contribute to the economic well-being of our state and to their own financial well-being. One way my office demonstrates that commitment is by providing significant scholarships for winning teams in the annual Personal Finance Challenge,” Stenberg said. Davidson said 887 students participated in the online test in their home schools, the first phase of the competition. The online test focused on money management, spending, credit, savings, and investing. First-place teams were selected at each of the three regional competition sites – Omaha, Lincoln, and Kearney. The teams that placed first in the regional events then were ranked first, second, and third statewide, based on the preliminary online tests taken earlier at each team’s home school. UNL College of Business Administration – Johnson-Brock, Nebraska City, Lincoln Southwest, and two teams from Malcolm. Omaha, UNO Mammel Hall – Concordia, Arlington, Pierce, Wausa, and Columbus. Kearney, UNK West Center Building – Arnold, Sutherland, Potter-Dix, and two teams from Alliance.